although I forget the name, I ate lunch at this beautiful little place on the water, with a view of the bridge into maine, over the summer, with deck seating and vines growing all over the fire escape. beautiful! too cold for that now, but I also had an awesome salmon sandwich! heck, they're all good! ^The Stock Pot? The Stock Pot has an indoor part as well with waterfront views. Thats a very good casual place. If you stay downtown you've got a lot of options in a pretty confined area. Here's a few places. Jumpin' Jays- seafood place, on the upscale side, good reviews, on Market St.
Old Ferry Landing- I've never had the food, but the location is great, right on the water off Ceres St.
thats it! also ate at the rosa restaurant, which was pretty good.. The same thing happened in portland with our old italian neighborhood...they build a highway through it, displacing tons of people to make an interstate arterial access way, and the built a hideous twin tower 17-story high rise amongst all the vast open land left over. now they are trying to redevelop this area and bring life back to it,,,,its called bayside. If you are in Portsmouth you have to get coffee at Breaking New Grounds, its a great cafe in market square, there is Joe's NY Pizza on Congress St which is great for a fast bite to eat, The Friendly toast is right across the street and has some really good and somewhat one of a kind food, very interesting place to eat the service isn't to great, but the food is awesome and the atmosphere is cool, they are open 24 hours a day on the week end. The Gas light is awesome, its right next to The Brewery on Market St. There are plenty other pubs, and restaurants, that we haven't mentioned that are worth checking out too. PORTSMOUTH -- If you drink a Smuttynose Portsmouth lager this week, it could be from the 15,000th barrel produced by the company this year. Smuttynose Brewing Co. has never before produced more than 15,000 barrels in a one-year span, making this year a benchmark that moves the company from the industry category of "micro brewery" to "regional independent brewery." Smuttynose is now in the same brewery category as independent beer giants Samuel Adams and West Coast-based company Sierra Nevada. On Tuesday, staffers celebrated with pints of the company beverage at the Heritage Drive brewery. Just a few hours earlier, they helped load kegs and bottles from the special batch onto a Bayside Distributor truck. National account manager Anka Jacobs said the Epping-based distributor will likely sell the 15,000th barrel to local restaurants and bars in the next few days. A barrel, by industry standards, is equal to two standard-sized kegs and 14 cases of beer. "We have moved up to a more elite level," said Smuttynose Brewing Company President Peter Egelston. Although the big breweries like the Anheuser-Busch Company still manufacture millions more barrels annually than Smuttynose, Egelston said reaching this new benchmark does bring some recognition and will help the company continue to expand. Egelston started the Smuttynose Brewing Company in 1994 during a time when many people were dabbling in the craft brew industry. After a few difficult years, the company began establishing itself in the community and has seen positive growth since 1998. In each of the past three years, Smuttynose Brewing Company has grown by more than 20 percent. This has allowed the brewery to purchase new and updated equipment, including a new 200 barrel fermenter, which helped increase production in the second half of 2006. Plans for 2007 call for installation of another fermenter and more updates to the Heritage Drive manufacturing center. "One of our big dreams is building a new facility for this brewery, so the public can come and share in our craft in a more meaningful way," Egelston said. "We are also faced with the challenge of how to continue to grow without losing your soul." His goal, after building a new brewery, is to produce 50,000 barrels annually, modest in comparison with Samuel Adams, which produces about a million barrels a year. "That's the level where we could still maintain the culture we have here," he said. Keeping a high quality beer and good work environment are important parts of his company's philosophy, something all employees take pride in, said Anka Jacobs. This is also one of the challenges of growing, she added, getting a fresh product to the distributors as far as Wisconsin and Virginia. "We are careful in our growth process, so we don't sell ourselves short and maintain a good product," she said. Thanks for the suggestions. I actually went to the Friendly Toast twice for breakfast while I was there (my brother is a vegetarian), and we didn't make it out at all for dinner cuz my aunt was cooking dinner every night. Portsmouth is a nice small city. I'd definitely consider going back if I ever get the chance to make it out to the east coast. Burlington and parts of portland are very similar. But I hate burlington, too crunchy. Portsmouth I love, though. very much like portland, just no tall buildings, but thats ok cause its closer to boston by like an hour. Crunchy? What is that, Portland slang? "Yo whats up with those old kicks? They're lookin kinda crunchy"
I guess New England slang, used to describe hippy areas - think granola-ish places - much of Vermont, Western NH, parts of Maine, Central Mass. There isnt much for portland slang. Crunch is another way of saying 'granola' as inwhat hippies always eat for snack. You know, cause granola is crunchy. It refers to places like berkely, CA too. and i think 'kicks' came out of california as well. portland slang would be more like: jeet? no, jew? yeah. jav? translation: did you eat/. no, did you? yes. what did you have? or mattaeah....tanslation -- I am out of here. PORTSMOUTH -- The froth has barely settled on another successful year for Smuttynose Brewing Co., but 2007 could be even busier if a proposed zoning change allows the local brewer to expand and stay local. The brewing company is seeking to relocate from its Market Street location to 10 acres on Lafayette Road. 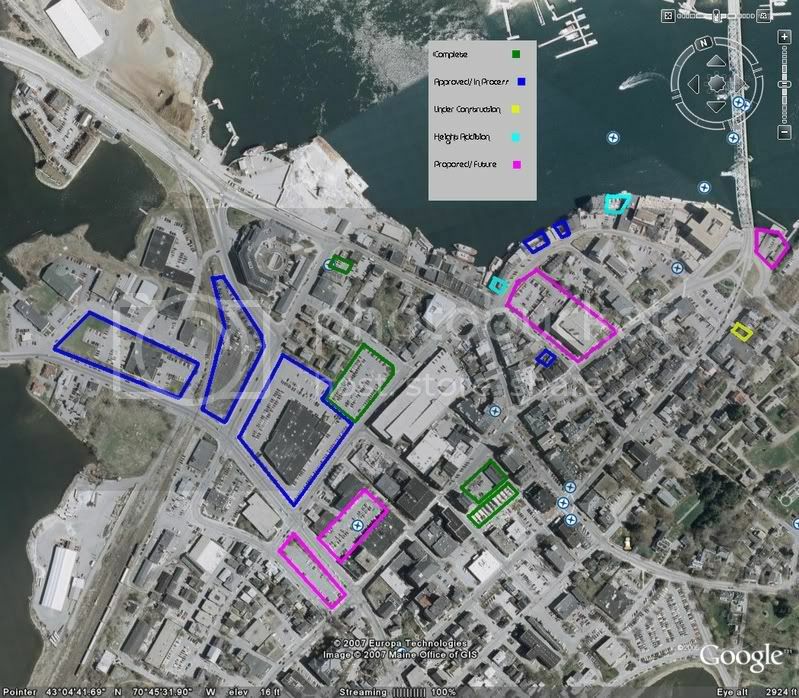 But there is no designated zone in Portsmouth that allows the brewery and its associated uses, including a restaurant, without a variance. Although applying for a zoning variance is still an option, President Peter Egelston and attorney Bernie Pelech are working with the city on a zoning ordinance amendment that would function as an overlay district in office research and industrial districts. "They're getting to the point where they've outgrown the space they are at now," said Pelech. "The plan is: There would be a brewery and a restaurant." The company has a purchase option on the property on Lafayette Road (Route 1), the address of which was not immediately available. The brewery was planning to relocate to Newmarket, but negotiations with the Newmarket Community Development Corporation fell apart at the end of 2005 and the project was brought to a screeching halt. At a recent Planning Board work session, Pelech said his client is now focused on remaining part of the community in which the successful business began. The amendment proposes to add a nonresidential "planned unit development" section to the ordinance, which would apply to tracts of land either located in an industrial zone and abutting an office research zone, or located in an office research zone and abutting an industrial zone. There are approximately two dozen parcels in the city that fit that description, according to city zoning maps. The proposal, Pelech said, is in accordance with the city's master plan. He also said there is no time frame for when the company hopes to begin development. The proposal is scheduled to be discussed at the Jan. 18 Planning Board meeting. Egelston started got Smuttynose Brewing Co. off to a difficult start in 1994, but demand for the product has grown more than 20 percent in each of the past three years. In 2006, the company produced 15,000 barrels -- the most it's ever done, upgrading the company from the "micro brewery" category to "regional independent brewery" status. The goal for the proposed new brewery is to produce 50,000 barrels annually. - This would be much better if they could get this in a downtown environment, if property in downtown Portsmouth is too expensive why not Dover or Newmarket? Ahhh, crunchy.... I see it now. It's funny to see the Portland slang. I feel like I'm getting in touch with my roots, haha. I was born in Portland but my family moved to Boston before I turned 1, so I don't really remember anything about it. leave our maine way of life alone. I always chuckle at such things, because the idea that portland is in jeoprady of becoming boston is absurd. PORTSMOUTH -- City officials believe plans submitted for the redevelopment of the Portsmouth Herald building will beautify the gateway to the city and lure visitors to the northern tier. Plans for the 2.3-acre lot along Maplewood Avenue include two buildings that would house retail stores, a restaurant, a caf?, a bank, business offices and 26 condominiums. The project would also include an underground parking facility with 189 spots. "It's a fairly innovative project," said City Planner David Holden. "This really marks the official redevelopment of the area and linking it to the downtown ... It looks like it will be an exciting project." Seacoast Media Group, publisher of the Herald, will relocate to Pease International Tradeport in February. The building will then be demolished to make way for the project. The parcel is considered a vital one in the city's quest to connect the downtown to the northern tier, which was part of the 2005 master plan. It will team with the Westin Inn hotel, conference center and parking garage as cornerstone projects that officials hope will revitalize the area. Plans call for one four-floor building with 37,240 square feet of ground floor space, located in the northern part of the property. There would be street-level space for retail, a restaurant and a bank, one floor of office space and two floors of condominiums, ranging from 1,700 square feet to 5,200 square feet. The other building would have 12,624 square feet of ground floor space with five floors at the southern-most area of the parcel. The top four floors would be business office space and the first floor would have two retail stores. The two buildings would be separated by green space and above-ground parking, which would be accessed by new entrances on Maplewood Avenue and Vaughn Street. A unique feature to the exterior of the building would be a wrap-around deck along the top floor of condominiums. At 42 and 50 feet, both buildings are taller than what would have been allowed if the building permit application was submitted two days later. There is an ordinance being discussed by the Planning Board that would decrease the maximum building height in the Central Business A district, where the site is located, from 50 feet to 40 feet. The ordinance, however, did not go to second reading prior to the application submission, which made the project exempt from any zoning change. Before receiving Planning Board approval, the project would have to go through the Historic District Commission, Traffic and Safety Committee and the Technical Advisory Committee. Lisa DeStefano, the architect for the project, said there is no time frame. She said her group wants to work with the land-use boards to ensure this is a project the community is behind. "We really are excited about the opportunity to build a new gateway to the city," she said. "We have a lot of exciting things going on in the city and with careful planning and careful design we can reinforce what is in the master plan." DeStefano said the builder could have paid the parking impact fee, but decided it was important to have the cars parked on site. Holden said the technology is available to make the large underground parking lot a reality. The property, which has been held by the Herald since 1972, was purchased by Mark Stevens and Susan Conway, who own a real estate investment company in Stratham, for $3.2 million in June. The new address for Seacoast Media Group will be 111 New Hampshire Avenue, a 72,000-square-foot facility that will consolidate editorial, print and distribution functions that had been split between Portsmouth and Stratham offices. i have said it before, but I love portsmouth. It is one of the few cities with a population of its size that really makes me want to visit time and again. It is so cool there, its a lot like Portland, just with people i dont know roaming the streets instead of the locals. Its like an alternate universe haha. DOVER ? Dickinson Development's latest waterfront plan includes curving roads that flow along the edge of the Cocheco River, leaving the committee overseeing the project encouraged and the developer feeling like he can see the "finish line." Presented by Dickinson's architect Garry Gardner of Sheskey Architects on Monday, the waterfront design plan takes a new approach that centers on the river, utilizing a Commonwealth Avenue-style central plaza that curves toward the Cocheco. In addition, a central avenue connects to a series of smaller roads, all of which now curve and flow along the water's edge. The curving roads allow for a variety of building shapes and styles to give the development a more organic feel, thus eliminating the "Comfort Inn" look. The central avenue also directs drivers and pedestrians toward a large pier, complete with floating dock and four kiosks to further attract visitors. Members of the Cochecho Waterfront Development Advisory Committee and residents recently asked Dickinson to consider changes to its plan to bring condos and office space to the roughly 30-acre city owed piece of property along the Cocheco River. The project still includes 180 units of housing, but through an expanded mix of housing options and adding more retail and office space. Dickinson's firm returned Monday with a plan that sought to appease resident's four main problems with earlier drafts, including that it failed to meet the vision laid out in the charette; did not focus on the Cocheco River; contained architecture that looked like a Comfort Inn; and did not include "vertical ownership" allowing people to own shops beneath and live above. Gardner described how the Dickinson team worked to bring the plan more in line with these goals. The plan still uses the "parcellization" concept, allowing for the market-driven development of smaller pieces of property inside the parcel. While the development's mix of retail and residential units has changed, the target homebuyer has not. The firm expects the project's 181 luxury condos, town homes, and flats to go anywhere between $450,000 and $750,000 each. The project includes 66,850 square feet of retail/office space, located primarily in a three-story 40,000-square-foot building along Washington Street. The new draft plan has additional buildings along the water's edge, which include retail/office space on the bottom floor and residential above. Mark Dickinson, president of Dickinson Development and a self-described "doubting Thomas" about adding more retail to the project, said he has been won over by residents enthusiasm and the community's need to continue a downtown feel along the river. Dickinson said the additional retail will work, coupled with the residential units above, but cautioned this approach carries more economic risk. Further, "pocket parking lots" were added to make these small retail spaces more viable. The project is now book ended by an expanded pier, with four kiosks, and a 5,000-square-foot restaurant. Pedestrians will have two options for how to connect with the area. An upper walk along the shops will give visitors a chance to see the homes and shops. A second boardwalk-style path will put visitors much closer to the river and allow for that "touch the water" feel some residents have been calling for. The plan does not include the expanded green park space along the water's edge contained in previous drafts. The plan does have a smaller section of parkland and riverwalk along the Cocheco. Gardner's presentation included a number of 3-D renderings of the project area, allowing residents to picture what it would look like crossing the planned Washington Street Bridge, or looking across the river from George's Marina, or from a canoe paddling up the Cocheco. The new bridge is in the engineering process and is seen as a critical component for the development's success. Funding for the bridge will come from a mix of state and local money, which the city council has already approved. If selected and approved, Dickinson said the best case is project's five year build out would start in the fall 2008; worst case spring 2009. The plan even gained favor with a group of longtime vocal critics, who said they were excited with the plan. PORTSMOUTH -- The owners of the Parade Office Mall, long known as an unsightly reminder of the 1970s urban renewal project, plan to raze the property and replace it with a pedestrian-friendly, mixed-use development. Details of the project layout will not be available until the Historic District Commission meeting Feb. 14, but Jeff Johnston, principle at Cathartes Private Investments, the Boston company that owns the site, confirmed the project is moving forward. Architect Lisa DeStefano said the proposal will include retail and office space, an extended-stay hotel, and residential units. Plans also include underground parking, as well as surface parking. The project is the latest in a series of proposed redevelopments of the northern tier. Other plans include the Westin Hotel, conference center and parking garage, the mixed-use development planned for the Portsmouth Herald property, and a project that has been submitted for 31 Raynes Ave. This project is considered Phase 2 of development for the Parade Mall area -- the first being the Hilton Garden Inn and Harbour Hill Condominium complex, which opened last year. Prior to the urban renewal movement of the 1960s and 1970s, the neighborhood, known as the North End, was a residential section populated mostly by Italian-American families. Bulldozers demolished the neighborhood to fuel economic development, as the renewal projects promised thousands of federal dollars. But historians and locals alike have bemoaned the sheet-metal structure erected there as an architectural blunder that did not fit the area. The site was specifically identified in the 1999 Northern Tier Study as one that needed redevelopment, which Johnston said was the goal since the purchase of the property in 2002. "The Parade Office Mall was an urban redevelopment that put a large building in the middle of a lot and put parking around it, and was not keeping with the character of the city," said Johnston. "So we're looking forward to putting mixed uses there and executing what's in the city's master plan." DeStefano said placing buildings along the street, widening sidewalks and having a pedestrian friendly layout can make the four-acre parcel a key component in connecting the norther tier to the downtown. She said she envisions an area of the city with its own character. "We're not looking to recreate other parts of Portsmouth here or change the character of the city," she said. "We're looking to create a new district." What she would like to re-create, however, is the energy that makes downtown Portsmouth so unique, she said, which can be done with smart planning and proper urban design. She said a marketing consultant was hired to ensure the project has components the city needs. "It's part of the city that's ready for growth." Dover and Portsmouth are changing fast. My only wish is that they would go up in height. 50 foot ordinance in Portsmouth just knocks the wind out of you! The locations for the Dover Riverfront and Portsmouth's Parade mall just scream build taller then 50 feet. 7-10 stories is not crazy and would look completely in place for Both cities. I completely agree, the sad part is I think Dover will win the height battle sooner or later, they dont care so much, and when the downtown infill starts to happen like it is now in Portsmouth, I have a feeling it will be higher. I just mapped it all out. The the picture is from like two years ago, so the green outlined areas are buildings which are already complete, the yellow is a building which is under construction, I believe its a five story building replacing, a three of four story one which I just ripped down. Teal are height additions which I thought was cool, both the buildings have or are currently adding a floor. Blue are green lighted projects, or ones which are still under going approval the two are Bow street I think got the go ahead, the small one at the end of the ally I am not so sure about they wanted to expand there building out to fill that little parking lot and add cafe space. And Purple are buildings which have stalled (the one next to rout one was proposed for a 3/four story brick building over a year ago, the larger lots have been sites of interest in which talk and some plans for development seem to be focusing.